Welcome To Habbox Forum; is where new members can introduce themselves to the forum for the first time, or maybe they are coming back after a long period of being away! People take time to write about themselves, so at least give them the courtesy of showing some interest. Try and say something in addition to "welcome to the forum" - try a nice comment or some friendly advice. Please don't spam the welcome forum with 'welcome' or 'welcome to habbox' constantly as it not only spams the activity feed it is considered as pointless posting. If you do so happen to spam the welcome forum your posts will be removed. If you have never used a forum before then this thread will come in handy. This thread covers all the basic actions on how to post a thread to how to change a signature. This 8 section guide can really help you along the way! 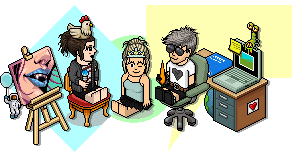 You can read up on the Habbox Forum basics here!